Business model, “110 Super Cub” released just 10 days ago. 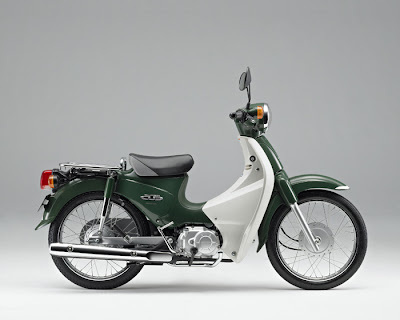 Honda has a powerful output characteristics of air-cooled single-cylinder four-stroke 110cc and with a total frame up a new engine model provides a good body size取RI回SHI “110 Super Cub”, Friday, June 19 release do. Super Cub 110 is required for business applications, developing a domestic-only model that combines economy and practicality. 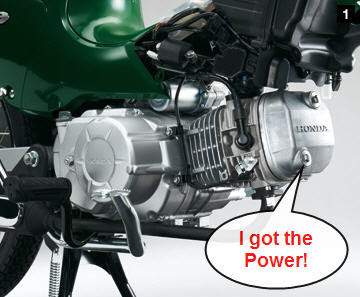 Engine, high-efficiency air-cooling technology to a low-friction 4-stroke single-cylinder 110cc engine. Electronic fuel injection (PGM-FI ※) and adoption of fuel efficiency is more than 90 Super Cub 63.5km / L (60km / h fixed area driving test values) have been achieved. Clutch system, clutch mechanism with a variable speed and launch an independent two-stage clutch system that will reduce the shock of speed change. The mission adopted by the four-speed, improving the comfort of cruising. Body, frame and adopt a new pipe design of the backbone type, with improved rigidity, while achieving the取RI回SHI buoyant. Design, but follow the traditional styling of the original Super Cub has been configured in a neat styling and a smooth surface suitable for the new generation of Super Cub. Super Cub series, the first model in 1958 to eight “Super Cub C100″ Since its launch, quiet and fuel-efficient, durable and reliable four-stroke engine, easy-to-type low-floor backbone乗RI降RI and frame, and the adoption of the automatic centrifugal clutch to clutch operation省ITA, long seller models are used for a wide range of users. Super Cub 110 is based on trust with the technology and durability over the years, developed a new generation of the Super Cub to achieve a high level of dynamic performance and environmental performance. Basic specifications of the engine, while the unified model and global sourcing parts from overseas factories. And production vehicles at Kumamoto in Japan, in order to raise the production efficiency, while achieving the affordable price. Do Ya think they're working with SYM again? That would be so fun. I must have one. Beautiful, and a truly classic evolution to the original. but then again, they could have taken it much further. The Cub's design easily allows for an automatic clutch. LED illumination all the way. ABS. And why not do an electric version? Cub forever! Interesting that they went with a tube frame instead of the traditional pressed steel. That means this "Supercub" is even more scooter-like underneath. If Honda really did make these available in the U.S. I'd consider trading in my CT110. Maybe if the Symba is still available when I get enough cash together, I'll get one of those. Thanks for scooping the news from Japan too. It looks to me like maybe the Symba spurred them to action. I like the handle bars better than the Symba's. The side do not have the traditional battery cover. That is a sweet-lookin' bike. I know the SYM Symba has caught fire here in the US, so maybe Honda will bring it over to the US. But, based on the high pricing of Honda's two latest U.S. scooter offerings, the new Elite and the SH150i, I sure hope the pricing on this Super Cub will be more in-line with it's closest competition…The SYM Symba at an MSRP of $2,598.00. I know its a Honda, but c'mon, it needs to be competitively priced for goodness sakes. Classic look retained and proper forks. That should be a winner, shame it's not 125cc. I think this is specially designed for business purpose. It will definitely work.